In the mid-19th century, John Ruskin played an important role as an art critic, teacher, theorist, and philosoper that advocated for the value of drawing. Ruskin's work remains relevant through the programs of the Guild of St George that was established to promote the importance and value of drawing. Through events like the Big Draw Festivals, Ruskin's advocacy of drawing for the fostering observation, discovery, and learning continue to have an impact. The 1862 International Exhibition in London was a big deal for Nova Scotia. David Honeyman, was commissioned by the government to oversee the organization, installation, and display of the "Nova Scotia Court" for the London Exhibition. This was a particularly exciting time, with a "gold rush" underway in Nova Scotia and gold was given special attention in the exhibits at the London Exhibition. "Specimens of gold in quartz-veins, of gold-dust, and of gold-ingots, from Nova Scotia, sent by Mr. Secretary Howe, were exhibited by Professor Tennant, F.G.S." (pg 38). 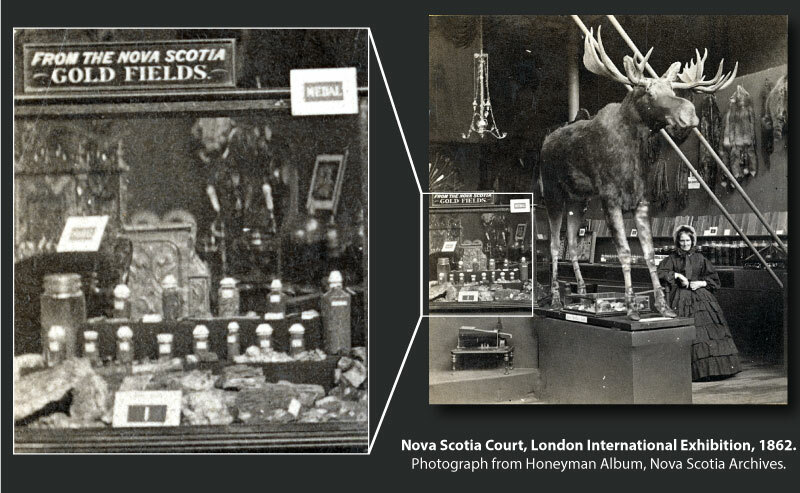 When the London International Exhibition opened in May 1862, an exhibit of samples "From the Nova Scotia Gold Fields" was prominantly displayed next to the Moose, and gold discoveries were promoted in the official Catalogue of Nova Scotia Department. Over six million people visited the Exhibition while it was open, from May to November, 1862. On October 23, 1862, a group from the Geologists' Association, including their President, Professor Tennant, visted the London Exhibition. When the group from the Geologist's Association visited the Nova Scotia Court, David Honeyman provided an overview of Nova Scotia Geology (Proc. Geologists' Association, Vol 1, pg 282-284). For his helpful contribution to the group, Honeyman was elected as an Honorary Member of the Geologists' Association in 1862, a recognition he valued throughout his life. A close friendship developed between Tennant and Honeyman, and at the end of the Exhibition the case that held the gold samples was given to Tennant. It seems possible that Honeyman may have provided Tennant with a couple of samples of gold quartz at this time as well. As noted in Professor Tennant's biography (ODB Torrens), John Ruskin was a student of Professor Tennant at King's, and Ruskin thought Tennant was "the best practical teacher I know of". Later in life, Ruskin developed his interest in geology, focusing attention on the unique features and characteristics of agate and publishing several papers on the subject (Ruskin 1867). Ruskin also later purchased a large collection of minerals from Professor Tennant, a sale that involved some controversy as Ruskin felt swindled from the deal and eventually had some of the cost returned along and extra mineral samples from Tennant. 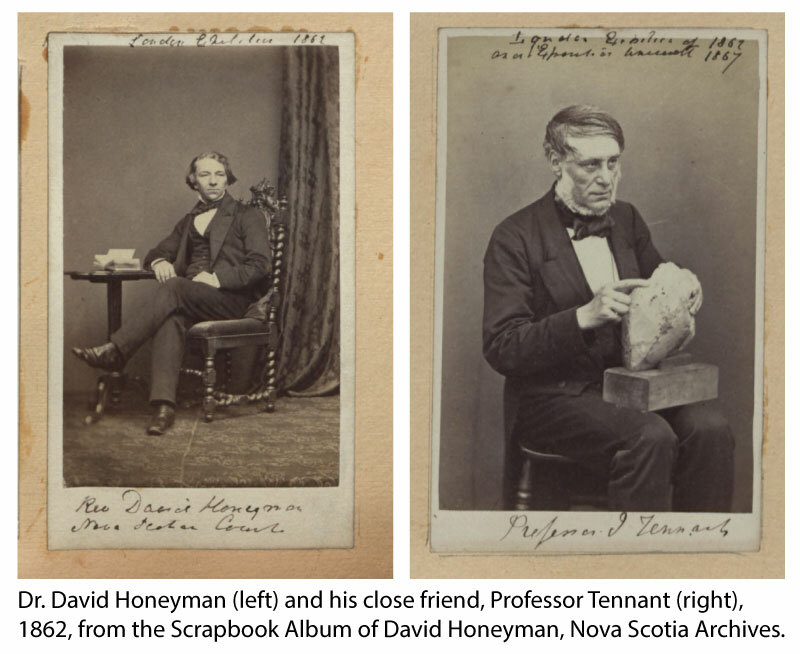 From the interactions between David Honeyman and Professor Tennant, we find several ways in which Professor Tennant may have acquired a sample of Nova Scotia quartz containing gold; either from the original samples provided by Joseph Howe in 1861, or as gifts from David Honeyman himself. 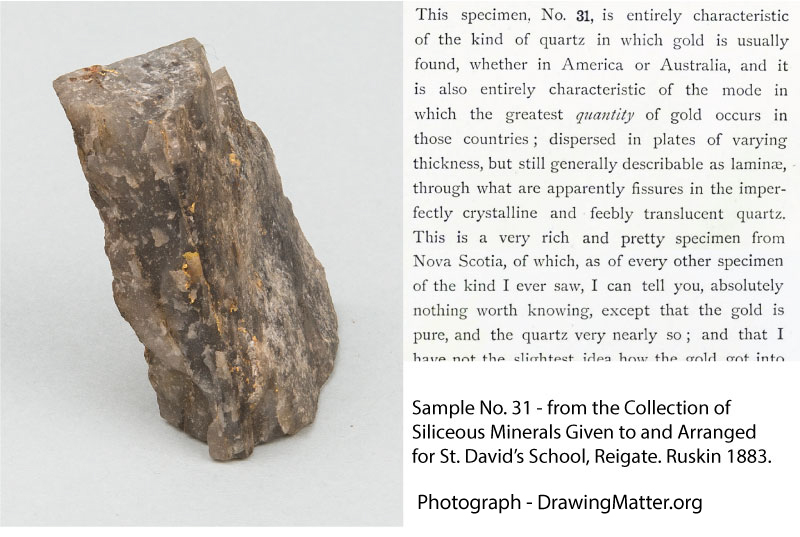 When John Ruskin purchased the minerals from Professor Tennant, it seems likely that the quartz sample (No. 31) was one of the specimens that Ruskin acquired. With this historical thread, we find linkages between the early collections and samples of Nova Scotia geology and the important art critic and educator, John Ruskin. Studies of historical museum collections like this provide opportunities to uncover details of the history of geoscience, and consider the impact of Nova Scotia geology on an international level. John Ruskin's interest in agates remains of particularly of interest here in Nova Scotia, where the official Provincial Gemstone of Nova Scotia is Agate. we wish John Ruskin a very Happy 200th Birthday!